Our facility features 1,500+ square feet of mat space, changing rooms, a large selection of training equipment (heavy bags, punch mitts, thai pads), and a variety of fitness equipment like kettle bells, medicine balls, jump ropes, stretch rails, pull up bars and more! We offer classes for all experience levels and ages, with the focus on learning effective new techniques and improving fitness. Our programs are great for adults and children alike, whether you’re looking to learn key techniques of mixed martial arts, build strength, flexibility and stamina, or just looking to stay in shape. Kids’ classes are also offered as an introduction to fitness, fun, respect, and discipline. Families are important to us and we strive to create an atmosphere to encourage parent involvement, offering seated viewing of classes and opportunities for participating in classes with your child. Kings MMA Anaheim’s mission is to develop a community that is open to everyone regardless of skills and fitness levels while providing the best possible martial arts training experience. Kings MMA Anaheim, we strive to give our students access seasoned and accomplished instructors from a variety of mixed martial arts backgrounds. Our instructors are qualified with decades of combined experience, world-class skill sets, and a true passion for martial arts. Our mission is to make your learning experience fun and enjoyable yet still informative and actionable. We offer a variety of classes for adults and children in a clean, safe environment for you to grow your self-defense skills. Meet some of our instructors below! Beneil “Benny” Dariush is a top-ranked professional Mixed Martial Artist who competes in the UFC (Ultimate Fighting Championship). 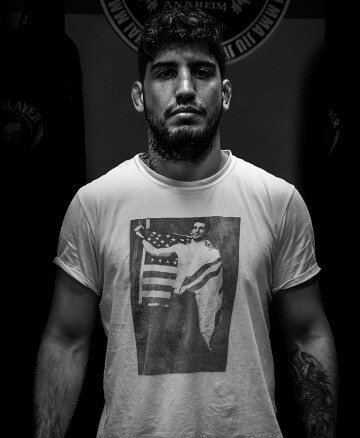 Prior to his successful MMA career, he was a big prospect in Brazilian Jiu Jitsu earning many world titles such as the IBJJF No-Gi World Champion, Pan American Champion, and World Champion Medalist. Beneil holds a black belt under Romulo Barral in Brazilian Jiu-Jitsu and is also a black belt in Muay under master Rafael Cordeiro. 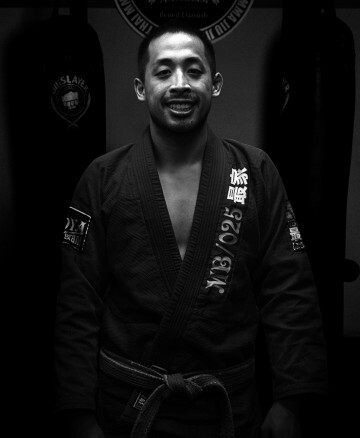 David is the lead instructor for the children and Adults Brazilian Jiu Jitsu program at Kings Anaheim. David is a Brazilian Jiu Jitsu brown belt under professor Beneil Dariush, training under his tutelage since since 2010 and also other Black Belt World Champions as well. 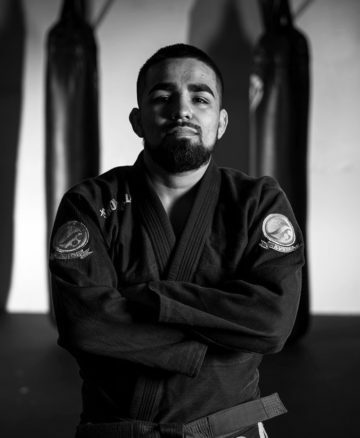 David has placed in several IBJJF tournaments including the Pan Americans,American Nationals and No-Gi World Championship. Aside from Brazilian Jiu Jitsu David is also a black belt in Tae Kwon Do and a red/blue belt in the Kings Muay Thai system under Nolan Ticman. David also has a Bachelor’s Degree in Child and Adolescent Development from California University of Fullerton. 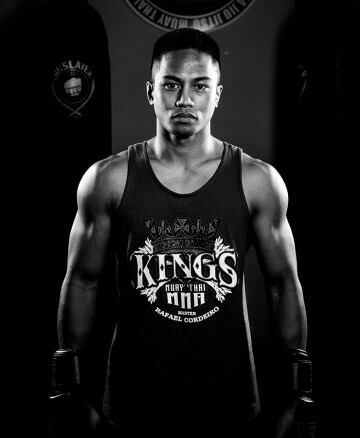 Arthur Estrazulas is a Black belt in Brazilian Jiu-jitsu and an up and coming MMA fighter for Kings MMA. Arthur is currently fighting for the fight organization Kings Of The Cage. 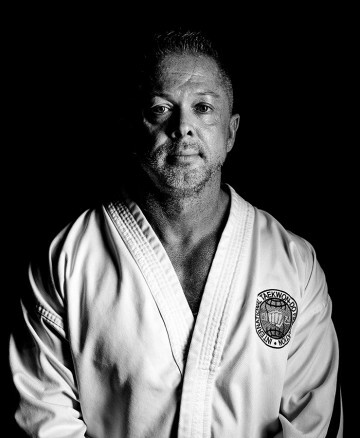 Lee Malone is a master in the art of Tae Kwon Do under the international Tae Kwon Do Federation. He has over 10 years of martial arts experience. Vincent has been training Brazilian Jiu-Jitsu since he was 15 years old. 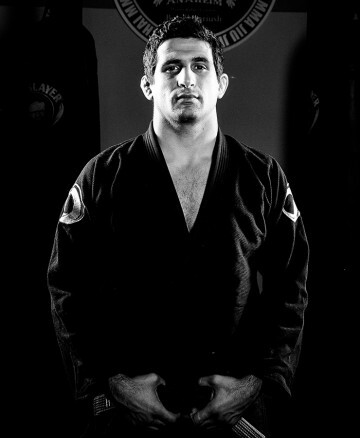 He currently holds a Brown Belt in Brazilian Jiu-Jitsu and has competed and won several tournaments during his journey. Aside from training with Professor Beneil Dariush he has also studied the art extensively from several other Brazilian Jiu-Jitsu world champions. Nolan Ticman is a professional Mixed Martial Artist who holds a brown belt in Brazilian Jiu Jitsu and a black belt in Muay Thai, and is also a former collegiate wrestler from the California State University of Fullerton. Nolan is a promising fighter coming out of Kings MMA and also trains some of the top fighters in the UFC. Nolan is a California State University of Fullerton alumni with a Bachelor’s degree in kinesiology. 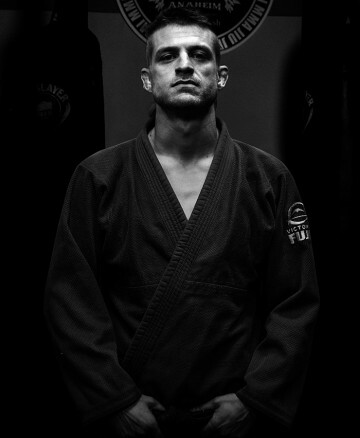 Nicholas Varkatsas is a black belt in Brazilian Jiu-Jitsu and has over 10 years of grappling experience. Nicholas also has a Bachelors degree in kinesiology and is currently working on receiving his masters degree. Brazilian Jiu Jitsu is a martial art and self defense system that focuses on grappling. It is based on the concept that a smaller, weaker person can successfully defend against a bigger, stronger assailant by using proper technique, leverage, and most notably, taking the fight to the ground, and then applying joint-locks and chokeholds to defeat the opponent. We offer advanced and beginner classes. Jiu Jitsu No Gi has the same fundamentals of Brazilian Jiu Jitsu, but in No-Gi, grabbing the clothes or traditional white garment (gi) is generally not allowed. Instead, practitioners can try to control an opponent by gripping the body’s natural handles, which changes the strategy of the practice. We offer advanced and beginner classes. Muay thai is a close-combat sport of Thailand that uses stand up striking along with various clinching techniques, often compared to kickboxing. It is characterized by the combined use of fists, elbows, knees & shins, and is associated with good physical preparation that makes a full contact fighter very efficient. Taekwondo is a well-rounded martial art which combines combat and self-defense techniques with sport and exercise, and is an excellent tool for physical fitness and character development for children. Tae kwon do is distinguished from other martial arts by its emphasis on high kicks, including spinning and jumping kicks, and fast hand techniques. This art provides students with respect for martial arts as well as for other people and teaches them the appropriate times to use their skills in class and for self-defense. We only offer children’s classes for Taekwondo. Children’s program is comprised of Muay Thai classes, Brazilian Jiu Jitsu, and Taekwondo. It provides children with a great foundation for martial arts, self defense, motor coordination and discipline. Age range is from 4 to 12 years old. 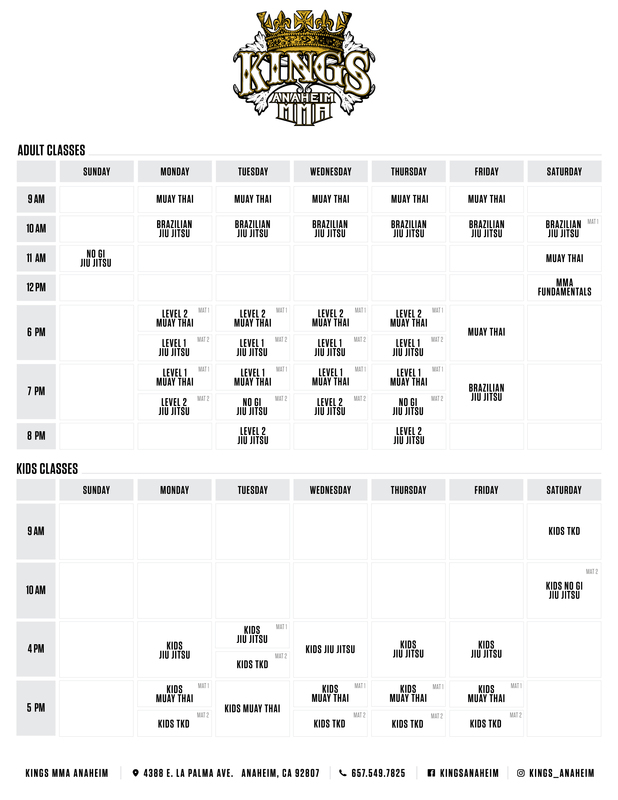 Can I train at Kings MMA Anaheim without any prior experience? Absolutely! We are a family oriented environment that caters to all levels, from the novice to pros. Is your academy for pro fighters only? No. We teach kids, teens, and adults of all skill and experience levels. At what age can you start training children? We can begin training children as young as 4 years of age in any of our Brazilian Jiu-Jitsu, Muay Thai or Tae Kwon Do programs. I want to try out your classes first, do you have a trial period? Yes! First time students can enjoy a 2-day trial free of charge with no strings attached. Who are your instructors and their backgrounds? Our instructors are highly credentialed martial artists, with many years of training and teaching experience. Most of our instructors are also formally educated and received bachelors degrees in various fields. Can I train at your gym as an out-of-towner? Congrats to Professor Beneil Dariush on his UFC Fight Night victory against Drew Dober! Congrats to Alex, Scott and Daniel on their achievement at the BJJ World League Tournament! Congrats to Ricky Garcia for placing third at the kids Pan American Games! congratulations to everyone who got promoted over the weekend! Congrats to Coach David on getting third place at the World Championships No-GI Brazilian Jiu-Jitsu! Brazilian Jiu-Jitsu belt promotion and potluck! Our Brazilian Jiu-Jitsu belt promotion and potluck will be on January 12, 2019! Mark your calendars. We will be closed December 24 and re-open on January 1st. Congrats to everyone who participated on the last Muay Thai event! Congrats to Sabina Mazo on defending her LFA title over the weekend! Congrats to Professor Benny on his recent UFC win in Colorado!